After receiving all my mobneys from the prop bets, I decided to parlay them into big bucks. Since I'm a masochist, I fired up two Razz cash games and an 18 player PLO8 SNG at the same time. I've always felt Razz is my best game (some day I hope to be as good as this guy), but tonight it kicked me in the junk. Repeatedly. 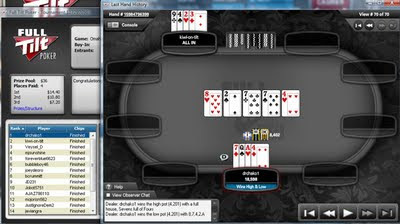 PLO8 is not my best game, but I do love the tournaments. I also love being the dominant chip leader for most of the game. Love the name of your HUs opponent. Nice win! !